Storms come in many different forms: blizzards, hurricane winds, thunder and lightening, or torential rain, but they also come in other forms too. Accidents, illness, and financial hits are but to name a few. It is winter in Vermont and though we were spared some of the snow that Boston got, I still look out and see oceans of white with gray skies. I am mostly shut-indoors, preferring to stay home where I can stay warm and comfortable. I have chronic lyme and seem to be on a never-ending treatment program and add to that, we just saw our tax man last night to work on our income taxes. It seems his software wasn't producing final figures in line with our income, and so we are waiting for him to see his software representative to be sure that there isn't some error? I couldn't figure out why my husband was so nervous about it all and then I remembered that he has lived all his life with what he calls "The Luck of the Irish". If it weren't for bad luck, he might not have any at all!! Of course if there is some penalty for working hard enough to throw us into the next tax bracket by a dollar or two, it will happen to us. Our spirits now seem to be matching the storms--rather gray and dark!! Comfort comes in many forms too: fun fabric and threads,patterns to last a life-time, Pinterest to stimulate even the most creatively challenged, good TV programs and books, and of course, good food! Although I am supposed to be on a special diet, I have discovered that I can make gluten-free cookies that are good enough to fool even my dubious family into thinking that they are tasty treats and a couple of cookies with a hot cup of tea bring immediate psychological comfort. When I made these I didn't have all the needed ingredients and my husband wasn't about to brave the mounting snow to get what I needed and so I cut up prunes to substitute for raisins in my gluten-free oatmeal raisin cookies. Fortunately I did have gluten-free oatmeal and gluten-free flour. 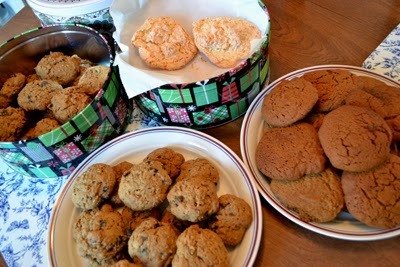 I call them "The Get-Loose-with-Jane Cookies" and don't have any problems being "regular" now! Being short of butter, the molasses cookies were made with shortening and I measured it like I measure butter, by the stick. I discovered later that I had twice the amount of shortening, and so I guesstimated the amount of ingredients needed to make a double batch, though not before trying to correct my error by adding more molasses and brown sugar.They were delicious, and likely never to be repeated again. The ones in the back tin were made of coconut, egg whites, sugar, salt, and vanilla...and I forgot to read the entire recipe, after reading that I was to whip the egg whites until frothy, NOT whipping them more after adding the sugar to form stiff peaks. Everyone thought they were like Rice Krispy Treats that I had simply made with coconut instead of cereal, and the more they spread out the crispier they became...again, a successful one-of-a-kind failure! I am moving back into the kitchen, after my daughter resigned as the head cook and baker. It was a position that she held for the past several years. I am rusty, but my skills seem to be slowly returning! I am learning that sometimes it is good to add an extra egg to better glue my baked goods together when using gluten-free flour, though I think I recall that Xantan gum is the real substitute for the glue in the gluten? No chance of any of that on hand! If only I could make them sugar-free as well, but then that would take the psychological comfort right out of these treats!! Sugar, my mother taught me, represents love, though in truth it only increases inflammation and pain, but old lessons die hard! I now hope that my quilting skills will return as easily as my baking skills! Working with cotton is different than working with wool, but with a bit of practice and getting some lessons on-line, perhaps I can create quilts much like I did these cookies and with a bit of trial and error, my quilts perhaps will turn out as sweet! Safe harbor from storms = sweetness, love and comfort! So now onto stitching!